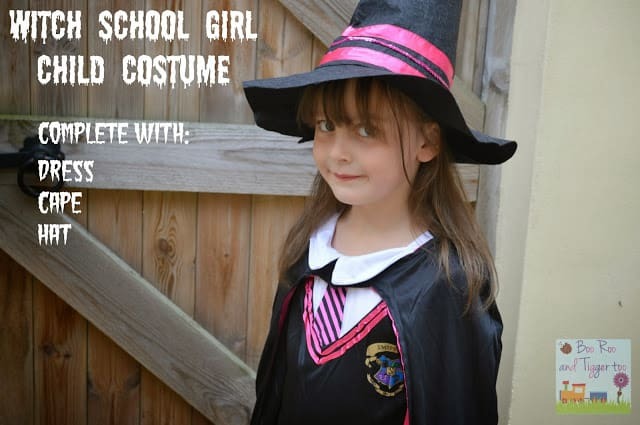 With Roo being a huge fan of Harry Potter and The Worst Witch books it seemed apt that she was sent a Witch School Girl Halloween fancy dress to review. 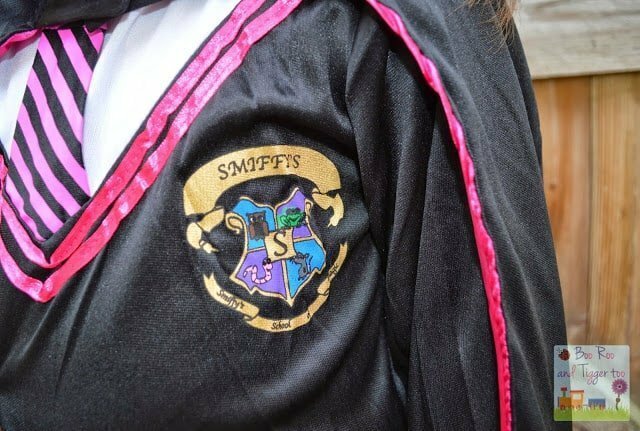 As soon as she saw the packaging she was pleased to see that it was both something that her heroine Hermonie Granger would wear and had flashes of pink. The all in one dress features a shirt and tie, pinafore style dress and school crest. It’s simply over the head design makes it easy to pop on and off, with no silly hook n loop fastenings at the rear (which children find impossible to do themselves). The cape is black, however features a fabulous hot pink interior which is invisible as they scoot off pretending to fly. 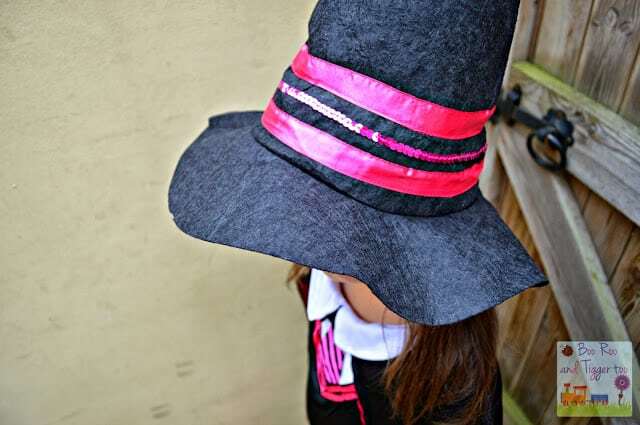 The tall felt hat finishes the outfit off perfectly, featuring the same hot pink found in the tie and cape. Tigger is well known for his dislike of dress up costumes so when he was kindly sent a toddler’s Halloween fancy dress costume I wasn’t sure if he would even try it on. 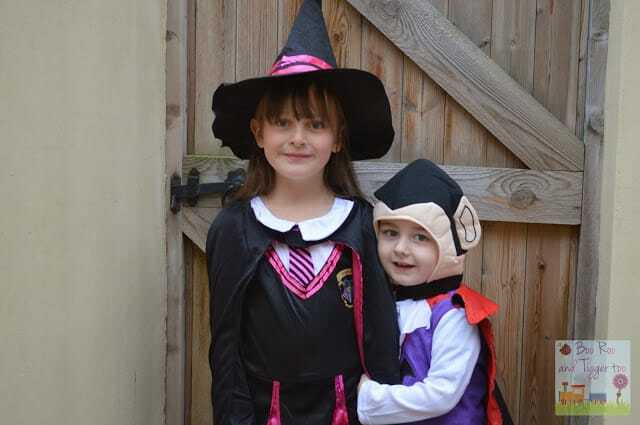 However, with Roo trying on her witches outfit he decided that he would quite like to dress up too (this is a huge breakthrough). 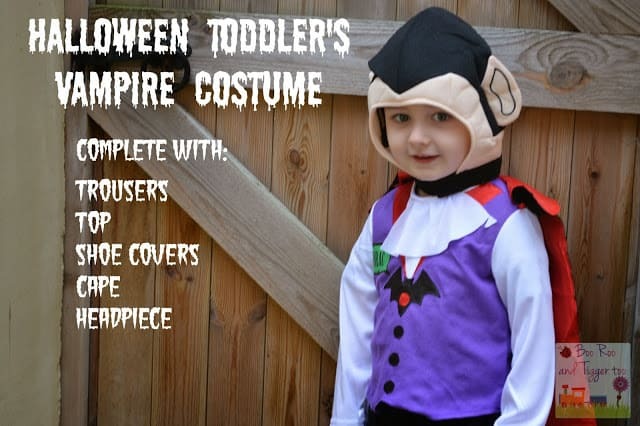 Unlike the Witch School Girl costume that is designed to be worn alone the toddler’s fancy dress costume can be placed over regular clothing or worn alone. The trousers have an elasticated waist enabling a better fit than either a button or hoop n loop fastening. The top is a simple over the head style fitting with one hook n loop fastening behind the head to secure. The black cape with red interior is simply attached with three hook n loop fastenings to the rear of the top. The head piece is straightforward to fit and secure with a simple hook n loop fastening under the chin, this ensures that it does not fall off with all the run around that toddler’s enjoy doing. Overall I was pleased with both the quality and wearability of the Halloween fancy dress costumes. I was pleased to see that the dress was easy enough for Roo to pop on by herself without having to ask anyone to fasten it up at the back. Tigger really surprised me by trying on the costume, although he preferred Roo’s witches hat to his own headpiece so next year maybe I’ll have two witches in the house! Disclosure Policy: We received the above Halloween fancy dress costumes FOC for the purpose of review.